The classic Nineteenth century station house at Brooks, ME. Located 12.26 miles inland from Belfast, this classic Nineteenth century structure was built by the Maine Central in 1881 and rebuilt in 1896 after a fire. 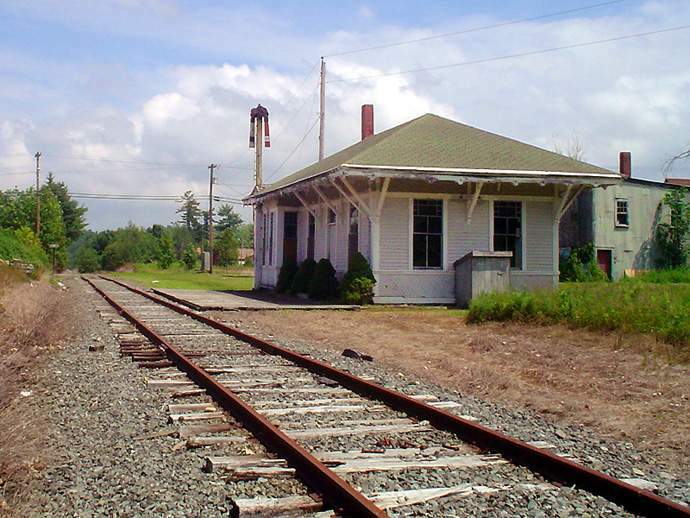 It is also one of only two surviving MEC era (1871-1925) passenger station houses still standing along the B&MLRR's 33-mile grade from Belfast to Burnham Junction. (The other is in Unity, ME.) For many years famed railroad photographer and historian Linwood Moody was the B&ML's station agent here. The Brooks station house (relabled "Camden") and the B&ML's two former Southern Railroad coaches were featured in the Hallmark Hall of Fame TV feature film "Skylark" starring Glenn Close and Christopher Walken which was filmed there in September, 1992. Photographed by Bruce C. Cooper (DigitalImageServices.com), July 16, 2004. Added to the photo archive by Bruce Cooper, July 16, 2004.